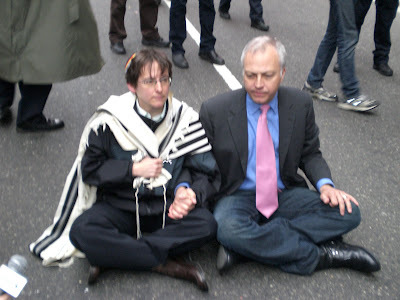 National Gay & Lesbian Task Force Executive Director Matt Foreman and Rabbi Sharon Kleinbaum were arrested for civil disobedience in today's ACT-UP/Queer Justice League demonstration against the "immoral" comments of Joint Chief's Chairman Peter Pace. 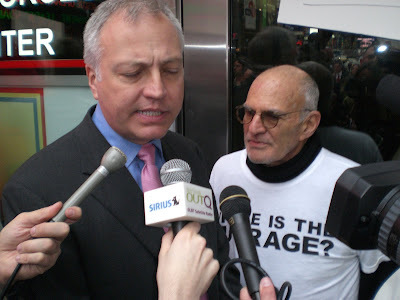 ABOVE: Foreman and Kleinbaum block Broadway, moments before they were handcuffed. 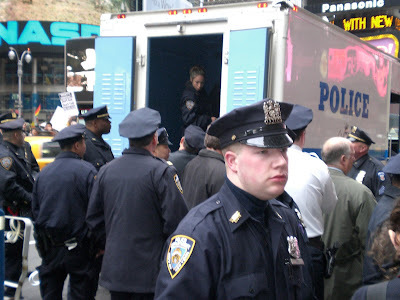 ABOVE: The NYPD closes in. 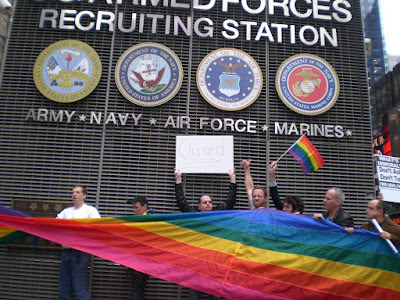 ABOVE: Minutes earlier, Foreman and Larry Kramer attempted to gain entrance to the recruiting station, but found it locked and abandoned. 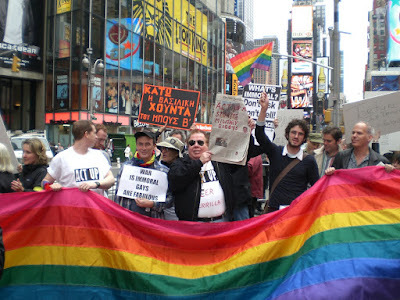 ABOVE: Former Gay Officers Action League president Edgar Rodriguez (right) joins in. 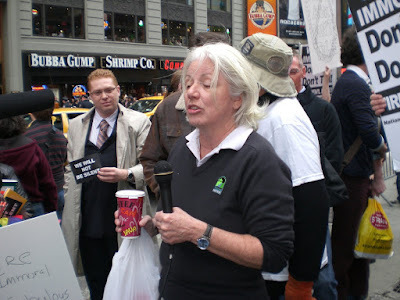 ABOVE: Activist Ann Northrop spoke eloquently to reporters. 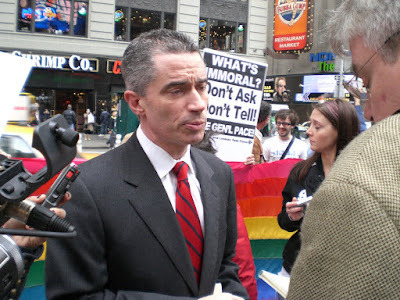 ABOVE: Former NJ Governor Jim McGreevey fields questions from the press. 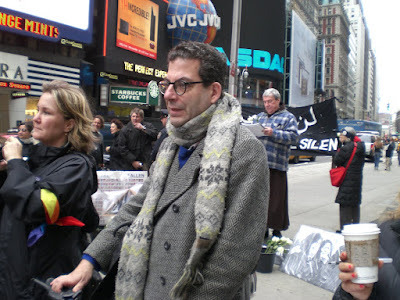 ABOVE: Village Voice gossip columnist Michael Musto arrived on his bike. 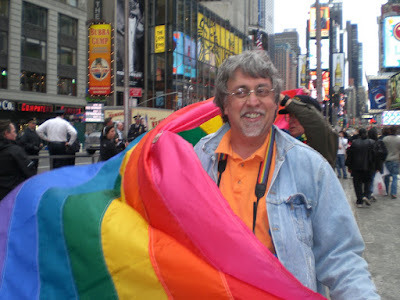 ABOVE: Rainbow flag creator Gilbert Baker leads the procession to wrap the Armed Forces Recruiting Station in our flag. After arresting Foreman, the police confiscated Baker's 100-ft. flag as evidence, as it was used to block traffic on Broadway. 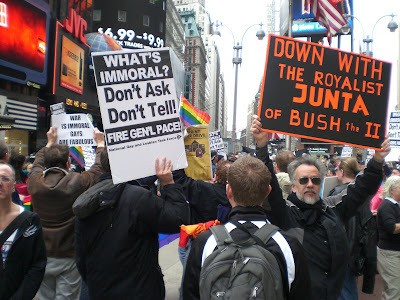 Gilbert protested the confiscation, but was merely given a voucher to recover his flag later. 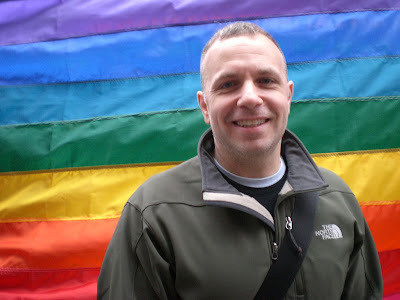 ABOVE: Author, activist and radio host Michelangelo Signorlile lends his support. 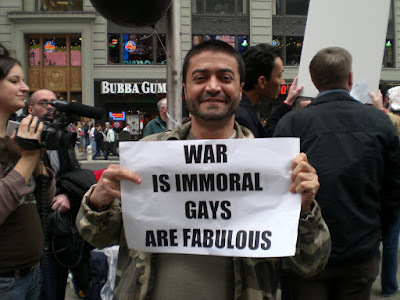 ABOVE: Vasco has it right. UPDATE: More photos on Towleroad. Video coverage at Good As You. 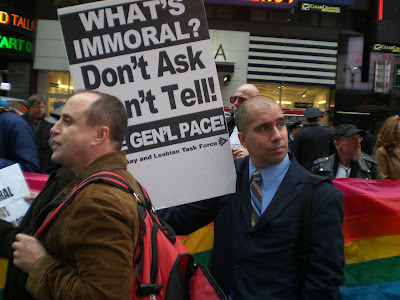 More extensive reportering can be found on veteran gay reporter Rex Wockner's blog, including a short interview with Larry Kramer. 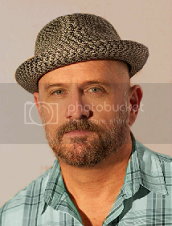 Andres Blabbeando has additional coverage. UPDATE II: The Task Force has issued a statement on Foreman's arrest. Attendance was rather light at the protest, probably less than 100, but not surprising given the fairly short notice and the time of the event. 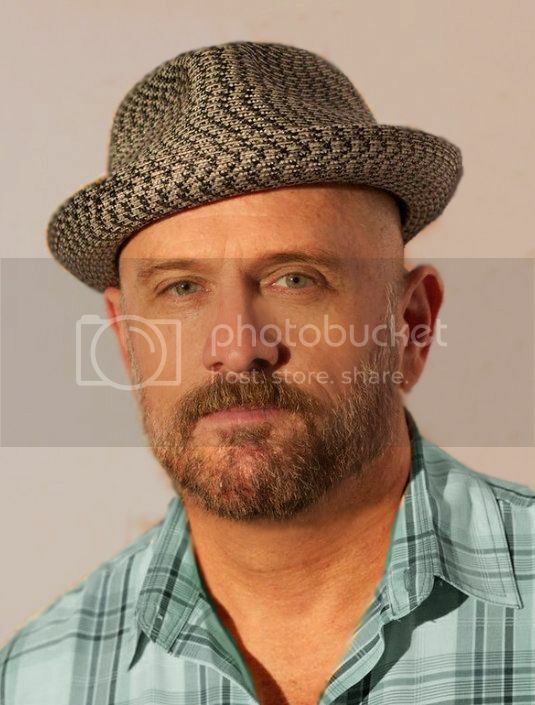 The police were initially genial, but became more brusque after Foreman and Kleinbaum sat down in the middle of Broadway, prompting a rush of press to photograph them.